Over the last couple of weeks I’ve been busy working on a new quilt, I was hoping it would be pretty quick to make, I’m making good progress but it is taking somewhat longer than anticipated! It’s her birthday mid September so I have a new date to aim for! These months have not been completely idle with the project, we’ve been working out exactly what she wants and I’ve been working out how to do it! 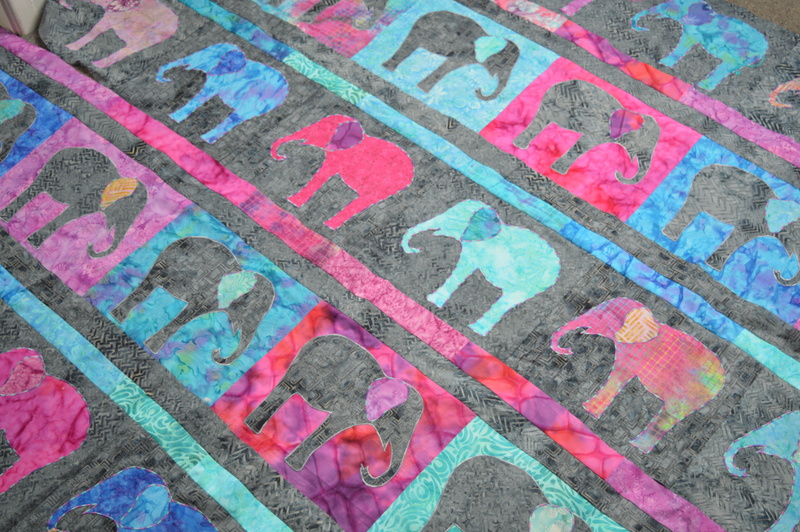 She wanted an elephant quilt in Bohemian colours! For the design I found two contenders, Paisley Splash by Windham Fabrics and Elephants by Laundry Basket Quilts. She chose Elephants but wanted it double bed size. I made the Paisley Splash pattern up for a charity quilt in the spring. So the elephant bit wasn’t too difficult to sort, but what would you call bohemian colours!! To me it is dark backgrounds with bright, jewel-like colours, deep pinks, purples, blues, I tried googling it to check but that didn’t help at all so I showed her a selection of fabrics and she seems happy! As it happened I had quite a few suitable fabrics in as I was planning to make a pansy quilt so I’d been collecting batics in pansy colours, the pansy quilt was obviously never going to get made so Helen’s quilt was the perfect project to use them on. I also had a layer cake from Hannah’s Room in dark pastel shades, some of which looked suitable. We also went to Embsay to get a background fabric and I spotted three batiks in elephant grey! Perfect, I thought!! With hindsight we might have been better with a darker grey, but elephant grey seemed a good choice for an elephant quilt! The elephants are all on a 10 x 12″ background. My design has evolved whilst making the quilt as I saw how the colours worked together. The grey muted the colours a lot more than I thought it would, some of them are pretty bright batiks but actually the lighter ones worked better than the bright ones. My plan now is to have five rows of six elephants, two of the rows are bright backgrounds with grey elephants and the other three are grey background with a bright elephant. In between each row is a 2″ strip of grey and another of colours, this gives me a bit more length for the quilt. 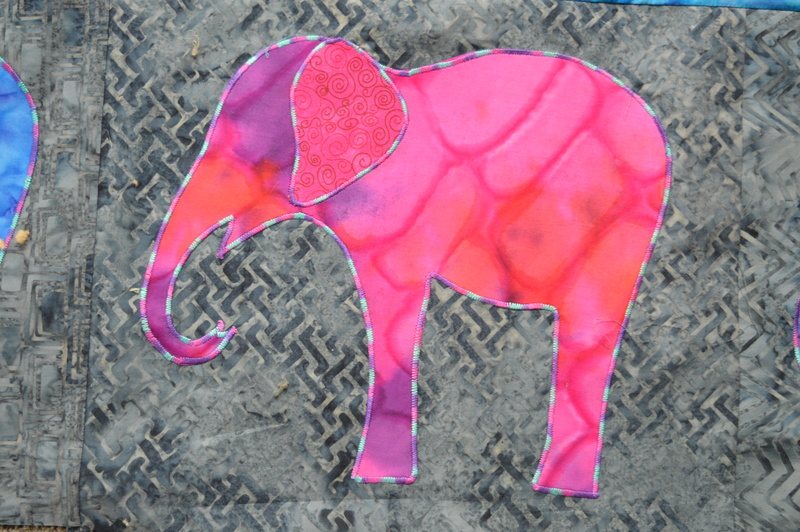 I stitched the coloured elephants first. I used bondaweb and a narrow zig-zag stitch round them. I happened to have two reels of a pink/purple/green Gutermann variegated thread in my stash, so I decided to try it. When I was stitching the first elephant I really wasn’t sure as it does come out a bit stripy, but when I stood back I liked it, it’s almost like a binding edge around it, even better it brought all the fabric colours together, I could use it on all the elephants as a unifying factor. The basic elephant shape took about 10 minutes to go round, which doesn’t sound too bad, except there are thirty of them so that’s about six hours!!! The grey elephants are stitched with a grey variegated thread which just adds a lighter outline to the dark elephants. My first major dilemma was the ears!! Do I try contrasting ears or co-ordinating ears! 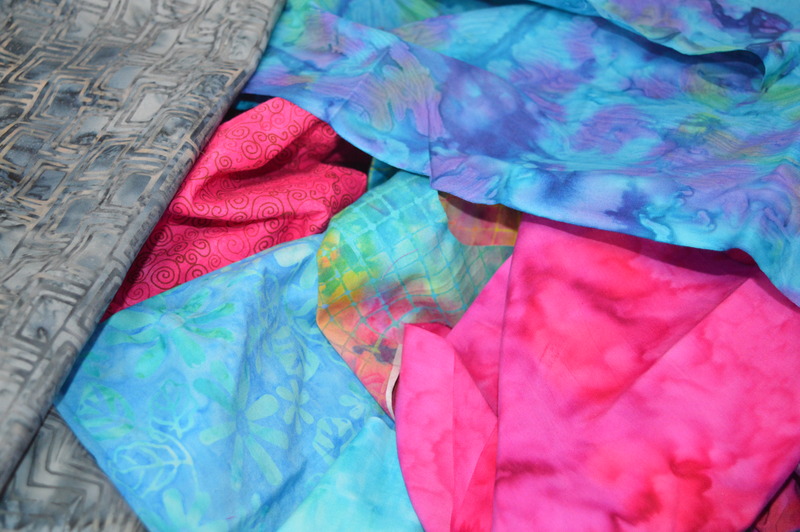 I’d managed to find eighteen different fabrics for the eighteen coloured elephants and I’d cut a body and an ear out in each so there was an unlimited number of variations!! I took a photo of each and asked on the quilting page on facebook, both photos were liked but it did help me decide on co-ordinated! My original thought with the grey elephants was to do a pink row and a blue row, but having arranged them they looked much better mixed up. The strips are varying lengths of 2″, this way I didn’t have to worry about matching seams or trying to co-ordinate colors again, I could just stitch them on! Last night I arranged all the squares on the floor, played with them a bit and stitched them into rows. Looking at the photo above the picture really doesn’t bring the colours out, it’s a lot more colourful than it looks!! I’ve decided to embroider the tails on to the elephants. Somehow I think the long fabric tails hanging down in the pattern make the elephant look sad, mine are going to have twirly, swishy, happy tails with two of them linking up on each row. I’ve got a big box of colourful perle threads so I’m using those and chain stitching the tail with straight stitches at the end. After the tails I’ve just to stitch the eyes (probably beads) and maybe a little tuft of hair on their foreheads. Wow, this will definately spruce up drab! The contrast of the ears is a very nice touch! Thank you, it’s coming together! wow this is gorgeous and it really going to brighten up Helen’s living quarters! That is such a fun and happy quilt, and I love the way the colours are a little ‘jumbo’d’ up! If she ever gets tired of it, can I have first dibs? 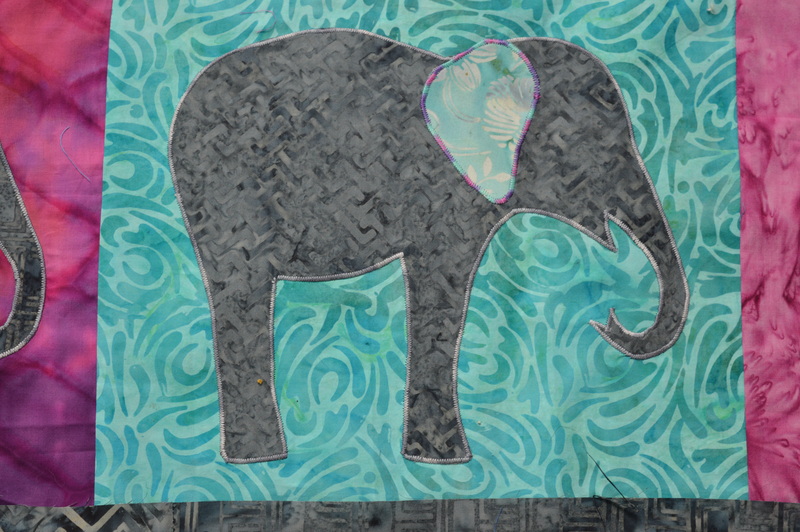 This is such an excellent use of batiks – they go so well with the elephant theme. The satin stitch looks great too, it really gives the elephant shapes a defined edging. I like the tails – the more swish the better for happy elephants – and I’m looking forward to seeing how you do the little tufts of hair. I can’t wait to see the finished quilt, will we have to wait until after Christmas? Thanks Tialys, I’m hoping to finish it for a birthday in just over a weeks time!! You are onto another winner here, it fits the brief perfectly. They are so cute. I’m sure your daughter will love it. It will certainly brighten her room. Daughter will be the envy of her group with such a delightful quilt! Thanks Bella, she’s really into elephants at the moment too! That’s a lot of elephants to stitch round! Its going to be lovey a quilt. Thanks Trisha, the elephants did seem endless at one point!! I’m half way through stitching tails on now! What a wonderful quilt! I’m a big fan of elephants too, and absolutely love this! The colours are lovely, and I love how you are working the tails. This will be sure to give her room a happy feel! Love this quilt, such fun and gorgeous colours. I adore batiks. Beautiful! I love how whimsical this quilt is! I think the coordinating ears are exActly right for these pachyderms, and I love the strips in between, they really bring it all together. This will be the talk of her barracks!